4. The Supreme is evolutionary- experiential self. 118:0.10 Creative growth is unending but ever satisfying, endless in extent but always punctuated by those personality -satisfying moments of transient goal attainment which serve so effectively as the mobilization preludes to new adventures in cosmic growth, universe exploration, and Deity attainment. 118:1.1 It is helpful to man’s cosmic orientation to attain all possible comprehension of Deity’s relation to the cosmos. 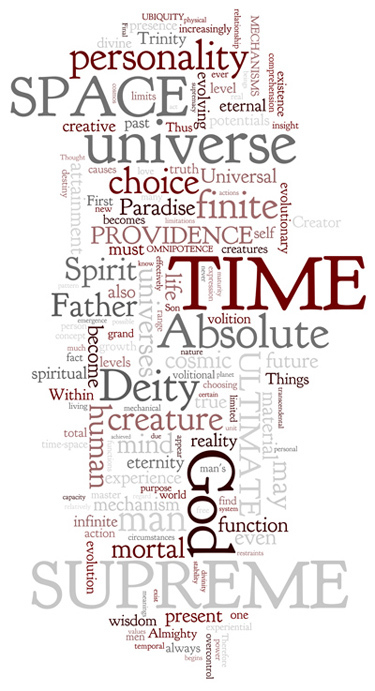 While absolute Deity is eternal in nature, the Gods are related to time as an experience in eternity. In the evolutionary universes eternity is temporal everlastingness—the everlasting now. 118:1.2 The personality of the mortal creature may eternalize by self-identification with the indwelling spirit through the technique of choosing to do the will of the Father. Such a consecration of will is tantamount to the realization of eternity-reality of purpose. This means that the purpose of the creature has become fixed with regard to the succession of moments; stated otherwise, that the succession of moments will witness no change in creature purpose. A million or a billion moments makes no difference. Number has ceased to have meaning with regard to the creature’s purpose. Thus does creature choice plus God’s choice eventuate in the eternal realities of the never-ending union of the spirit of God and the nature of man in the everlasting service of the children of God and of their Paradise Father. 118:2.1 The ubiquity of Deity must not be confused with the ultimacy of the divine omnipresence. It is volitional with the Universal Father that the Supreme, the Ultimate, and the Absolute should compensate, co-ordinate, and unify his time-space ubiquity and his time-space-transcended omnipresence with his timeless and spaceless universal and absolute presence. And you should remember that, while Deity ubiquity may be so often space associated, it is not necessarily time conditioned. 118:2.2 As mortal and morontia ascenders you progressively discern God through the ministry of God the Sevenfold. Through Havona you discover God the Supreme. On Paradise you find him as a person, and then as finaliters you will presently attempt to know him as Ultimate. Being finaliters, there would seem to be but one course to pursue after having attained the Ultimate, and that would be to begin the quest of the Absolute. No finaliter will be disturbed by the uncertainties of the attainment of the Deity Absolute since at the end of the supreme and ultimate ascensions he encountered God the Father. Such finaliters will no doubt believe that, even if they should be successful in finding God the Absolute, they would only be discovering the same God, the Paradise Father manifesting himself on more nearly infinite and universal levels. Undoubtedly the attainment of God in absolute would reveal the Primal Ancestor of universes as well as the Final Father of personalities. 118:2.3 God the Supreme may not be a demonstration of the time-space omnipresence of Deity, but he is literally a manifestation of divine ubiquity. Between the spiritual presence of the Creator and the material manifestations of creation there exists a vast domain of the ubiquitous becoming—the universe emergence of evolutionary Deity. 118:2.4 If God the Supreme ever assumes direct control of the universes of time and space, we are confident such a Deity administration will function under the overcontrol of the Ultimate. In such an event God the Ultimate would begin to become manifest to the universes of time as the transcendental Almighty (the Omnipotent) exercising the overcontrol of supertime and transcended space concerning the administrative functions of the Almighty Supreme. 118:2.5 The mortal mind may ask, even as we do: If the evolution of God the Supreme to administrative authority in the grand universe is attended by augmented manifestations of God the Ultimate, will a corresponding emergence of God the Ultimate in the postulated universes of outer space be attended by similar and enhanced revelations of God the Absolute? But we really do not know. 118:3.1 Only by ubiquity could Deity unify time-space manifestations to the finite conception, for time is a succession of instants while space is a system of associated points. You do, after all, perceive time by analysis and space by synthesis. You co-ordinate and associate these two dissimilar conceptions by the integrating insight of personality. Of all the animal world only man possesses this time-space perceptibility. To an animal, motion has a meaning, but motion exhibits value only to a creature of personality status. 118:3.2 Things are time conditioned, but truth is timeless. The more truth you know, the more truth you are, the more of the past you can understand and of the future you can comprehend. 118:3.3 Truth is inconcussible—forever exempt from all transient vicissitudes, albeit never dead and formal, always vibrant and adaptable—radiantly alive. But when truth becomes linked with fact, then both time and space condition its meanings and correlate its values. Such realities of truth wedded to fact become concepts and are accordingly relegated to the domain of relative cosmic realities. 118:3.4 The linking of the absolute and eternal truth of the Creator with the factual experience of the finite and temporal creature eventuates a new and emerging value of the Supreme. The concept of the Supreme is essential to the co-ordination of the divine and unchanging overworld with the finite and ever-changing underworld. 118:3.5 Space comes the nearest of all nonabsolute things to being absolute. Space is apparently absolutely ultimate. The real difficulty we have in understanding space on the material level is due to the fact that, while material bodies exist in space, space also exists in these same material bodies. While there is much about space that is absolute, that does not mean that space is absolute. 118:3.6 It may help to an understanding of space relationships if you would conjecture that, relatively speaking, space is after all a property of all material bodies. Hence, when a body moves through space, it also takes all its properties with it, even the space which is in and of such a moving body. 118:3.7 All patterns of reality occupy space on the material levels, but spirit patterns only exist in relation to space; they do not occupy or displace space, neither do they contain it. But to us the master riddle of space pertains to the pattern of an idea. When we enter the mind domain, we encounter many a puzzle. Does the pattern—the reality—of an idea occupy space? We really do not know, albeit we are sure that an idea pattern does not contain space. But it would hardly be safe to postulate that the immaterial is always nonspatial. 118:4.1 Many of the theologic difficulties and the metaphysical dilemmas of mortal man are due to man’s mislocation of Deity personality and consequent assignment of infinite and absolute attributes to subordinate Divinity and to evolutionary Deity. You must not forget that, while there is indeed a true First Cause, there are also a host of co-ordinate and subordinate causes, both associate and secondary causes. 118:4.2 The vital distinction between first causes and second causes is that first causes produce original effects which are free from inheritance of any factor derived from any antecedent causation. Secondary causes yield effects which invariably exhibit inheritance from other and preceding causation. 118:4.3 The purely static potentials inherent in the Unqualified Absolute are reactive to those causations of the Deity Absolute which are produced by the actions of the Paradise Trinity. In the presence of the Universal Absolute these causative-impregnated static potentials forthwith become active and responsive to the influence of certain transcendental agencies whose actions result in the transmutation of these activated potentials to the status of true universe possibilities for development, actualized capacities for growth. It is upon such matured potentials that the creators and controllers of the grand universe enact the never-ending drama of cosmic evolution. 118:5.1 The omnipotence of Deity does not imply the power to do the nondoable. Within the time-space frame and from the intellectual reference point of mortal comprehension, even the infinite God cannot create square circles or produce evil that is inherently good. God cannot do the ungodlike thing. Such a contradiction of philosophic terms is the equivalent of nonentity and implies that nothing is thus created. A personality trait cannot at the same time be Godlike and ungodlike. Compossibility is innate in divine power. And all of this is derived from the fact that omnipotence not only creates things with a nature but also gives origin to the nature of all things and beings. 118:5.2 In the beginning the Father does all, but as the panorama of eternity unfolds in response to the will and mandates of the Infinite, it becomes increasingly apparent that creatures, even men, are to become God’s partners in the realization of finality of destiny. And this is true even in the life in the flesh; when man and God enter into partnership, no limitation can be placed upon the future possibilities of such a partnership. When man realizes that the Universal Father is his partner in eternal progression, when he fuses with the indwelling Father presence, he has, in spirit, broken the fetters of time and has already entered upon the progressions of eternity in the quest for the Universal Father. 118:5.3 Mortal consciousness proceeds from the fact, to the meaning, and then to the value. Creator consciousness proceeds from the thought-value, through the word-meaning, to the fact of action. Always must God act to break the deadlock of the unqualified unity inherent in existential infinity. Always must Deity provide the pattern universe, the perfect personalities, the original truth, beauty, and goodness for which all subdeity creations strive. Always must God first find man that man may later find God. Always must there be a Universal Father before there can ever be universal sonship and consequent universal brotherhood. 118:6.1 God is truly omnipotent, but he is not omnificent—he does not personally do all that is done. Omnipotence embraces the power-potential of the Almighty Supreme and the Supreme Being, but the volitional acts of God the Supreme are not the personal doings of God the Infinite. 118:6.3 Within a local frame, volition may appear to function as an uncaused cause, but it unfailingly exhibits inheritance factors which establish relationship with the unique, original, and absolute First Causes. 118:6.4 All volition is relative. In the originating sense, only the Father-I AM possesses finality of volition; in the absolute sense, only the Father, the Son, and the Spirit exhibit the prerogatives of volition unconditioned by time and unlimited by space. Mortal man is endowed with free will, the power of choice, and though such choosing is not absolute, nevertheless, it is relatively final on the finite level and concerning the destiny of the choosing personality. 118:6.5 Volition on any level short of the absolute encounters limitations which are constitutive in the very personality exercising the power of choice. Man cannot choose beyond the range of that which is choosable. He cannot, for instance, choose to be other than a human being except that he can elect to become more than a man; he can choose to embark upon the voyage of universe ascension, but this is because the human choice and the divine will happen to be coincident upon this point. And what a son desires and the Father wills will certainly come to pass. 118:6.6 In the mortal life, paths of differential conduct are continually opening and closing, and during the times when choice is possible the human personality is constantly deciding between these many courses of action. Temporal volition is linked to time, and it must await the passing of time to find opportunity for expression. Spiritual volition has begun to taste liberation from the fetters of time, having achieved partial escape from time sequence, and that is because spiritual volition is self-identifying with the will of God. 118:6.7 Volition, the act of choosing, must function within the universe frame which has actualized in response to higher and prior choosing. The entire range of human will is strictly finite-limited except in one particular: When man chooses to find God and to be like him, such a choice is superfinite; only eternity can disclose whether this choice is also superabsonite. 118:7.1 The function of Creator will and creature will, in the grand universe, operates within the limits, and in accordance with the possibilities, established by the Master Architects. This foreordination of these maximum limits does not, however, in the least abridge the sovereignty of creature will within these boundaries. Neither does ultimate foreknowledge—full allowance for all finite choice—constitute an abrogation of finite volition. A mature and farseeing human being might be able to forecast the decision of some younger associate most accurately, but this foreknowledge takes nothing away from the freedom and genuineness of the decision itself. The Gods have wisely limited the range of the action of immature will, but it is true will, nonetheless, within these defined limits. 118:7.2 Even the supreme correlation of all past, present, and future choice does not invalidate the authenticity of such choosings. It rather indicates the foreordained trend of the cosmos and suggests foreknowledge of those volitional beings who may, or may not, elect to become contributory parts of the experiential actualization of all reality. 118:7.3 Error in finite choosing is time bound and time limited. It can exist only in time and within the evolving presence of the Supreme Being. Such mistaken choosing is time possible and indicates (besides the incompleteness of the Supreme) that certain range of choice with which immature creatures must be endowed in order to enjoy universe progression by making freewill contact with reality. 118:7.4 Sin in time-conditioned space clearly proves the temporal liberty—even license—of the finite will. Sin depicts immaturity dazzled by the freedom of the relatively sovereign will of personality while failing to perceive the supreme obligations and duties of cosmic citizenship. 118:7.6 The bestowal of life renders material-energy systems capable of self-perpetuation, self-propagation, and self-adaptation. The bestowal of personality imparts to living organisms the further prerogatives of self-determination, self-evolution, and self-identification with a fusion spirit of Deity. 118:7.7 Subpersonal living things indicate mind activating energy-matter, first as physical controllers, and then as adjutant mind-spirits. Personality endowment comes from the Father and imparts unique prerogatives of choice to the living system. But if personality has the prerogative of exercising volitional choice of reality identification, and if this is a true and free choice, then must evolving personality also have the possible choice of becoming self-confusing, self-disrupting, and self-destroying. The possibility of cosmic self-destruction cannot be avoided if the evolving personality is to be truly free in the exercise of finite will. 118:7.8 Therefore is there increased safety in narrowing the limits of personality choice throughout the lower levels of existence. Choice becomes increasingly liberated as the universes are ascended; choice eventually approximates divine freedom when the ascending personality achieves divinity of status, supremacy of consecration to the purposes of the universe, completion of cosmic-wisdom attainment, and finality of creature identification with the will and the way of God. 118:8.1 In the time-space creations, free will is hedged about with restraints, with limitations. Material-life evolution is first mechanical, then mind activated, and (after the bestowal of personality) it may become spirit directed. Organic evolution on the inhabited worlds is physically limited by the potentials of the original physical-life implantations of the Life Carriers. 118:8.2 Mortal man is a machine, a living mechanism; his roots are truly in the physical world of energy. Many human reactions are mechanical in nature; much of life is machinelike. But man, a mechanism, is much more than a machine; he is mind endowed and spirit indwelt; and though he can never throughout his material life escape the chemical and electrical mechanics of his existence, he can increasingly learn how to subordinate this physical-life machine to the directive wisdom of experience by the process of consecrating the human mind to the execution of the spiritual urges of the indwelling Thought Adjuster. 118:8.3 The spirit liberates, and the mechanism limits, the function of will. Imperfect choice, uncontrolled by mechanism, unidentified with spirit, is dangerous and unstable. Mechanical dominance insures stability at the expense of progress; spirit alliance liberates choice from the physical level and at the same time assures the divine stability produced by augmented universe insight and increased cosmic comprehension. 118:8.4 The great danger that besets the creature is that, in achieving liberation from the fetters of the life mechanism, he will fail to compensate this loss of stability by effecting a harmonious working liaison with spirit. Creature choice, when relatively liberated from mechanical stability, may attempt further self-liberation independent of greater spirit identification. 118:8.5 The whole principle of biologic evolution makes it impossible for primitive man to appear on the inhabited worlds with any large endowment of self-restraint. Therefore does the same creative design which purposed evolution likewise provide those external restraints of time and space, hunger and fear, which effectively circumscribe the subspiritual choice range of such uncultured creatures. As man’s mind successfully overstrides increasingly difficult barriers, this same creative design has also provided for the slow accumulation of the racial heritage of painfully garnered experiential wisdom—in other words, for the maintenance of a balance between the diminishing external restraints and the augmenting internal restraints. 118:8.6 The slowness of evolution, of human cultural progress, testifies to the effectiveness of that brake—material inertia—which so efficiently operates to retard dangerous velocities of progress. Thus does time itself cushion and distribute the otherwise lethal results of premature escape from the next-encompassing barriers to human action. For when culture advances overfast, when material achievement outruns the evolution of worship-wisdom, then does civilization contain within itself the seeds of retrogression; and unless buttressed by the swift augmentation of experiential wisdom, such human societies will recede from high but premature levels of attainment, and the “dark ages” of the interregnum of wisdom will bear witness to the inexorable restoration of the imbalance between self-liberty and self-control. 118:8.7 The iniquity of Caligastia was the by-passing of the time governor of progressive human liberation—the gratuitous destruction of restraining barriers, barriers which the mortal minds of those times had not experientially overridden. 118:8.8 That mind which can effect a partial abridgment of time and space, by this very act proves itself possessed of the seeds of wisdom which can effectively serve in lieu of the transcended barrier of restraint. 118:8.9 Lucifer similarly sought to disrupt the time governor operating in restraint of the premature attainment of certain liberties in the local system. A local system settled in light and life has experientially achieved those viewpoints and insights which make feasible the operation of many techniques that would be disruptive and destructive in the presettled eras of that very realm. 118:8.10 As man shakes off the shackles of fear, as he bridges continents and oceans with his machines, generations and centuries with his records, he must substitute for each transcended restraint a new and voluntarily assumed restraint in accordance with the moral dictates of expanding human wisdom. These self-imposed restraints are at once the most powerful and the most tenuous of all the factors of human civilization—concepts of justice and ideals of brotherhood. Man even qualifies himself for the restraining garments of mercy when he dares to love his fellow men, while he achieves the beginnings of spiritual brotherhood when he elects to mete out to them that treatment which he himself would be accorded, even that treatment which he conceives that God would accord them. 118:9.1 Time and space are a conjoined mechanism of the master universe. They are the devices whereby finite creatures are enabled to coexist in the cosmos with the Infinite. Finite creatures are effectively insulated from the absolute levels by time and space. But these insulating media, without which no mortal could exist, operate directly to limit the range of finite action. Without them no creature could act, but by them the acts of every creature are definitely limited. 118:9.2 Mechanisms produced by higher minds function to liberate their creative sources but to some degree unvaryingly limit the action of all subordinate intelligences. To the creatures of the universes this limitation becomes apparent as the mechanism of the universes. Man does not have unfettered free will; there are limits to his range of choice, but within the radius of this choice his will is relatively sovereign. 118:9.3 The life mechanism of the mortal personality, the human body, is the product of supermortal creative design; therefore it can never be perfectly controlled by man himself. Only when ascending man, in liaison with the fused Adjuster, self-creates the mechanism for personality expression, will he achieve perfected control thereof. 118:9.4 The grand universe is mechanism as well as organism, mechanical and living—a living mechanism activated by a Supreme Mind, co-ordinating with a Supreme Spirit, and finding expression on maximum levels of power and personality unification as the Supreme Being. But to deny the mechanism of the finite creation is to deny fact and to disregard reality. 118:9.5 Mechanisms are the products of mind, creative mind acting on and in cosmic potentials. Mechanisms are the fixed crystallizations of Creator thought, and they ever function true to the volitional concept that gave them origin. But the purposiveness of any mechanism is in its origin, not in its function. 118:9.6 These mechanisms should not be thought of as limiting the action of Deity; rather is it true that in these very mechanics Deity has achieved one phase of eternal expression. The basic universe mechanisms have come into existence in response to the absolute will of the First Source and Center, and they will therefore eternally function in perfect harmony with the plan of the Infinite; they are, indeed, the nonvolitional patterns of that very plan. 118:9.7 We understand something of how the mechanism of Paradise is correlated with the personality of the Eternal Son; this is the function of the Conjoint Actor. And we have theories regarding the operations of the Universal Absolute with respect to the theoretical mechanisms of the Unqualified and the potential person of the Deity Absolute. But in the evolving Deities of Supreme and Ultimate we observe that certain impersonal phases are being actually united with their volitional counterparts, and thus there is evolving a new relationship between pattern and person. 118:9.8 In the eternity of the past the Father and the Son found union in the unity of the expression of the Infinite Spirit. If, in the eternity of the future, the Creator Sons and the Creative Spirits of the local universes of time and space should attain creative union in the realms of outer space, what would their unity create as the combined expression of their divine natures? It may well be that we are to witness a hitherto unrevealed manifestation of Ultimate Deity, a new type of superadministrator. Such beings would embrace unique prerogatives of personality, being the union of personal Creator, impersonal Creative Spirit, mortal-creature experience, and progressive personalization of the Divine Minister. Such beings could be ultimate in that they would embrace personal and impersonal reality, while they would combine the experiences of Creator and creature. Whatever the attributes of such third persons of these postulated functioning trinities of the creations of outer space, they will sustain something of the same relation to their Creator Fathers and their Creative Mothers that the Infinite Spirit does to the Universal Father and the Eternal Son. 118:9.9 God the Supreme is the personalization of all universe experience, the focalization of all finite evolution, the maximation of all creature reality, the consummation of cosmic wisdom, the embodiment of the harmonious beauties of the galaxies of time, the truth of cosmic mind meanings, and the goodness of supreme spirit values. And God the Supreme will, in the eternal future, synthesize these manifold finite diversities into one experientially meaningful whole, even as they are now existentially united on absolute levels in the Paradise Trinity. 118:10.1 Providence does not mean that God has decided all things for us and in advance. God loves us too much to do that, for that would be nothing short of cosmic tyranny. Man does have relative powers of choice. Neither is the divine love that shortsighted affection which would pamper and spoil the children of men. 118:10.2 The Father, Son, and Spirit—as the Trinity—are not the Almighty Supreme, but the supremacy of the Almighty can never be manifest without them. The growth of the Almighty is centered on the Absolutes of actuality and predicated on the Absolutes of potentiality. But the functions of the Almighty Supreme are related to the functions of the Paradise Trinity. 118:10.3 It would appear that, in the Supreme Being, all phases of universe activity are being partially reunited by the personality of this experiential Deity. When, therefore, we desire to view the Trinity as one God, and if we limit this concept to the present known and organized grand universe, we discover that the evolving Supreme Being is the partial portraiture of the Paradise Trinity. And we further find that this Supreme Deity is evolving as the personality synthesis of finite matter, mind, and spirit in the grand universe. 118:10.4 The Gods have attributes but the Trinity has functions, and like the Trinity, providence is a function, the composite of the other-than-personal overcontrol of the universe of universes, extending from the evolutionary levels of the Sevenfold synthesizing in the power of the Almighty on up through the transcendental realms of the Ultimacy of Deity. 118:10.5 God loves each creature as a child, and that love overshadows each creature throughout all time and eternity. Providence functions with regard to the total and deals with the function of any creature as such function is related to the total. Providential intervention with regard to any being is indicative of the importance of the function of that being as concerns the evolutionary growth of some total; such total may be the total race, the total nation, the total planet, or even a higher total. It is the importance of the function of the creature that occasions providential intervention, not the importance of the creature as a person. 118:10.6 Nevertheless, the Father as a person may at any time interpose a fatherly hand in the stream of cosmic events all in accordance with the will of God and in consonance with the wisdom of God and as motivated by the love of God. 118:10.7 But what man calls providence is all too often the product of his own imagination, the fortuitous juxtaposition of the circumstances of chance. There is, however, a real and emerging providence in the finite realm of universe existence, a true and actualizing correlation of the energies of space, the motions of time, the thoughts of intellect, the ideals of character, the desires of spiritual natures, and the purposive volitional acts of evolving personalities. The circumstances of the material realms find final finite integration in the interlocking presences of the Supreme and the Ultimate. 118:10.8 As the mechanisms of the grand universe are perfected to a point of final precision through the overcontrol of mind, and as creature mind ascends to the perfection of divinity attainment through perfected integration with spirit, and as the Supreme consequently emerges as an actual unifier of all these universe phenomena, so does providence become increasingly discernible. 118:10.9 Some of the amazingly fortuitous conditions occasionally prevailing on the evolutionary worlds may be due to the gradually emerging presence of the Supreme, the foretasting of his future universe activities. Most of what a mortal would call providential is not; his judgment of such matters is very handicapped by lack of farsighted vision into the true meanings of the circumstances of life. Much of what a mortal would call good luck might really be bad luck; the smile of fortune that bestows unearned leisure and undeserved wealth may be the greatest of human afflictions; the apparent cruelty of a perverse fate that heaps tribulation upon some suffering mortal may in reality be the tempering fire that is transmuting the soft iron of immature personality into the tempered steel of real character. 118:10.10 There is a providence in the evolving universes, and it can be discovered by creatures to just the extent that they have attained capacity to perceive the purpose of the evolving universes. Complete capacity to discern universe purposes equals the evolutionary completion of the creature and may otherwise be expressed as the attainment of the Supreme within the limits of the present state of the incomplete universes. 118:10.11 The love of the Father operates directly in the heart of the individual, independent of the actions or reactions of all other individuals; the relationship is personal—man and God. The impersonal presence of Deity (Almighty Supreme and Paradise Trinity) manifests regard for the whole, not for the part. The providence of the overcontrol of Supremacy becomes increasingly apparent as the successive parts of the universe progress in the attainment of finite destinies. As the systems, constellations, universes, and superuniverses become settled in light and life, the Supreme increasingly emerges as the meaningful correlator of all that is transpiring, while the Ultimate gradually emerges as the transcendental unifier of all things. 118:10.16 On a planet of this advanced order, providence has become an actuality, the circumstances of life are correlated, but this is not only because man has come to dominate the material problems of his world; it is also because he has begun to live according to the trend of the universes; he is following the pathway of Supremacy to the attainment of the Universal Father. 118:10.17 The kingdom of God is in the hearts of men, and when this kingdom becomes actual in the heart of every individual on a world, then God’s rule has become actual on that planet; and this is the attained sovereignty of the Supreme Being. 118:10.18 To realize providence in time, man must accomplish the task of achieving perfection. But man can even now foretaste this providence in its eternity meanings as he ponders the universe fact that all things, be they good or evil, work together for the advancement of God-knowing mortals in their quest for the Father of all. 118:10.19 Providence becomes increasingly discernible as men reach upward from the material to the spiritual. The attainment of completed spiritual insight enables the ascending personality to detect harmony in what was theretofore chaos. Even morontia mota represents a real advance in this direction. 118:10.23 When men pray for providential intervention in the circumstances of life, many times the answer to their prayer is their own changed attitudes toward life. But providence is not whimsical, neither is it fantastic nor magical. It is the slow and sure emergence of the mighty sovereign of the finite universes, whose majestic presence the evolving creatures occasionally detect in their universe progressions. Providence is the sure and certain march of the galaxies of space and the personalities of time toward the goals of eternity, first in the Supreme, then in the Ultimate, and perhaps in the Absolute. And in infinity we believe there is the same providence, and this is the will, the actions, the purpose of the Paradise Trinity thus motivating the cosmic panorama of universes upon universes.